Al Borg Laboratories, the largest chain of largest laboratories in MENA has announced their participation as Platinum sponsor of the Arab Health 2016, the largest health and medical trade show in the Middle East. Taking place from 25th to 28th January, Arab Health anticipates more than 93,000 delegates and 4,000 exhibitors coming together to showcase progress and achievement in the sector. With an impeccable track record of more than 15 years in the laboratory business Al Borg is present in Saudi, UAE, Qatar, Oman ,Bahrain, Kuwait and Ethiopia. It is the largest chain of private standalone medical laboratories in MENA region with over 40 branches conducting over 6 Million tests a year. Over the years the company has developed strong clientele across the GCC market supported by strong logistic facility and a combine professional manpower of over 1100 employee. In 2013, The company entered into a strategic partnership with Quest Diagnostics (USA) to market all the diagnostic information services and products from Quest Diagnostics in the KSA. 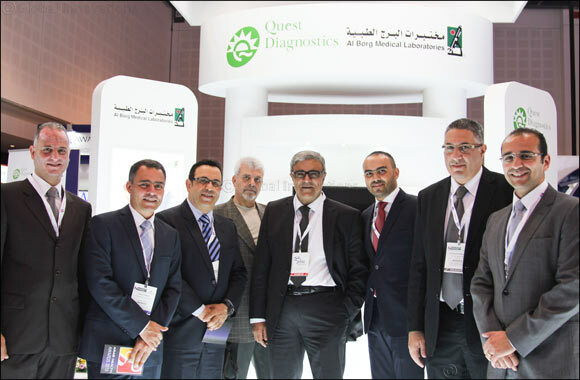 The partnership between Al Borg and Quest Diagnostics combines the largest group of private medical laboratories in the Gulf Region, and the world leader in innovative diagnostic tests and advanced healthcare information technology solutions. Under the agreement the clients have access to high quality testing and lab services to reduce healthcare spending while enabling employees to embrace prevention and take charge of their health. The sincere efforts with attention to all details and adherence to the highest international standards and specifications, has moved Al Borg Medical Laboratories forwards to be the leading provider for integrated laboratory services and solutions and helped them to fulfill their commitment and to provide excellent medical services to their clients everywhere.